Dear Bob, Thank you for deciding to broadcast the CD "Il Legno e la Parola". Perhaps one of the most thought provoking elements in recording this CD was the interpretation of Cage's silences. It was obvious that by their very nature, their interpretation was bound to cause controversy and debate, in line with the spirit of Cage's works, and I am thankful to your provoking article for that. The idea of interpreting the silences with completely blank tracks was intended to allow listeners the opportunity to recreate and discover their own "personal" silence at each listening. Each silence is thus entirely determined by the ever changing non-intentional ambient sounds at the moment of listening. I purposely refrained from the most obvious temptation of recording my own ambient sounds, or for that matter, any other seemingly random sound that would have been inevitably crystallized in time and ultimately determined entirely by the interpreter's choice. I personally prefer the interpreter to completely disappear in Cage's silences. As John Cage says ..."the most beautiful sound is the sound of what happens". I thought of myself at a crossroads in the late forties as a result of many things occurring. One was the experience of going into an anechoic chamber at Harvard University. I expected to hear no sound at all because it was a room made as silent as possible. But in that room I heard two sounds, and I was so surprised that I went to the engineer in charge and said, "There's something wrong: there are two sounds in that room." I described them, and he said the high one was my nervous system in operation and the low one was my blood circulating. So I realized that I was making music unintentionally continuously. So I felt myself to be at a crossroads where I could proceed as my body was proceeding, unintentionally, or I could continue intentionally. But since everyone else was doing that, it seemed more reasonable and more useful to society if I took this other direction. Simone's lighthearted mention of noise canceling headphones highlights a quite serious anomaly in the way music is listened to today. The advent of mobile media such as iPods means the majority of listening is now done on headphones. Yet virtually all recordings are mixed for conventional speaker formats. The anomaly is that headphones cannot reproduce the in-front-of listener sound image of the original mix. 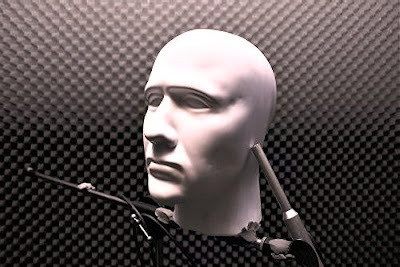 This is because headphones position the sound image inside the listener's head between the ears, rather than ahead of the listener as is intended. The same misplacement of the sound image occurs when multi-channel format recordings such as SACD are reproduced via headphones. To reproduce an in-front-of listener sound image requires a different microphone technique, which creates binaural rather than conventional stereo sound. 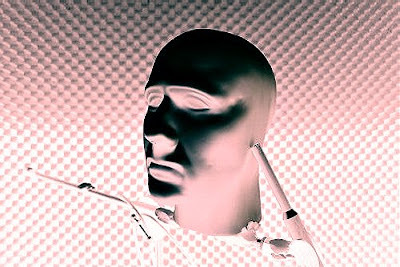 This microphone technique uses a device known as a dummy head and one is seen in my header photo in an anechoic chamber, which brings this path full circle. Will the ascendancy of the iPod result in a resurgence in 'made for headphones' recordings? I wonder what John Cage would have done with the possibilities opened up by the iPod and headphones? There is a useful history of binaural recordings here and different ambient sounds feature here. All of which leads us to the Tao of music. * Podcast of my Chance Music programme featuring John Cage's three works for amplified plants can be heard here. *** The interview quoted above is transcribed in the invaluable CageTalk edited by Peter Dickinson (ISBN 1580462375). Your comment about recordings being mixed for speakers and not for headphones is so true. And when you have worked in the industry as a producer, both radio and recordings, as I have, you really notice the edit points and even shifts in ambience and instrument/microphone placements from take to take. Recently I was listening to Ashkenazy's Beethoven Sonata cycle. CD 1 is NOT headphone friendly. Some of the edits are very messy (which can also be noticed on speakers), and the shift in the placement of the piano and/or mics from take to take is so dramatic you would think you were actually listening to a sonata for TWO pianos. I've done my own research, I've matched the sounds I hear in my head with a sounds I created using computer software .. turns out it's a complex combination of continuous tones between 7 and 9 kilohertz, with varying amplitudes in both ears that phase shift slowly, creating an always present, always moving, living soundtrack. Man, is it annoying. All one can do is give in to it, call it my own personal music, and try to enjoy it. But clearly, as far as I'm concerned, there is no such thing as silence, never was, never will be.